laab moo : spicy isaan minced pork salad. *in a small saucepan over high heat, bring the stock to a boil. *add the meat and cook for 1 to 2 minutes, tossing often with a large spoon to break up the meat and cook it to fairly evenly. *when the meat is cooked, remove the pan from the heat. *stir in the shallot, cilantro, spring onion, and most of the mint. *add the lime juice, fish sauce, rice powder, grated galanga, ground chilli, and sugar; stir to combine everything well. *taste and adjust seasoning as needed for a pleasing balance of sour, salty, and hot. 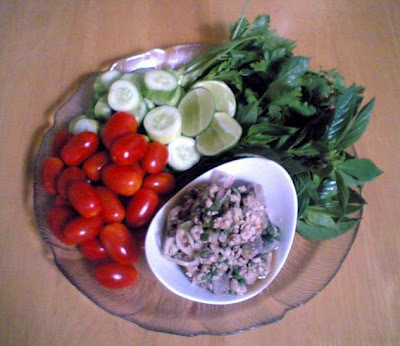 *line a serving platter with lettuce leaves, cucumbers, cherry tomatoes, mint leaves & sweet basil leaves.